Veteran author Bill Bryson delights in skewering the arrogant rich in England and the United States, particularly the folks who lived in the 19th and early 20th centuries in this quirky survey book. His litany of the vast number of servants, silverware, and foodstuffs at meals make his point. 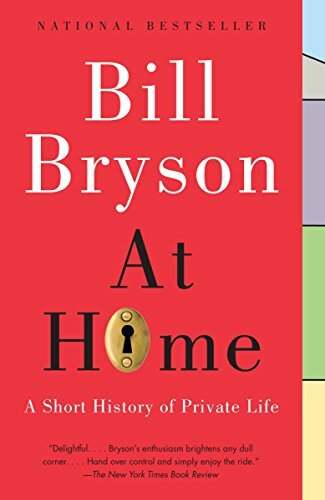 The premise of this nonfiction, historical book is that an individual home is an excellent jumping off point to a wide variety of subjects. Bryson happens to live in a former church rectory that was built in 1851. While his home is not typical of most, it is clearly an excellent basis for an historic survey. This is a loosely structured stroll through many centuries and cultures with Bryson as the tour guide. He was born in the United States and educated here; however, his manner of speaking is clearly influenced by his long-time residence in England. The notion of inventiveness and progress being a function of opportunity and dedication to an idea is a thread that runs through many chapters, each of which focuses on a particular room or area of his home. The associations are reminiscent of the Public Broadcast System series, “Connections,” narrated by James Burke. The tangents developed within each chapter tend to take the reader a bit far afield from the room being featured. The basement, for example, correlates to the notion of a sturdy underpinning for the home that evolves into a survey of the evolution of construction, culminating in the Eiffel Tower. This is clearly a case of going from the mundane to the sublime in a matter of pages. Conversely, the study, a room that might easily provide a scenario related to reading, education and leisure time, instead, becomes the scene of mice and extermination. The chapter is easily the most disconcerting as it focuses on the vermin and critters with which we share our homes. Bryson seems to delight in the mind-numbing and chilling statistics for mouse and rat populations of the past and present. He concludes the chapter with the smallest living creatures in our homes and on our persons, namely insects and microbes. Underlying the premise is a charming and unexpected feature. Many of the chapters draw attention to the unsung heroes who were the real inventors as opposed to the person who made vast sums of money and achieved fame. Included for good measure are the names of men who almost got it right but for a twist or turn in their path have not even made it to footnote status in history. At Home is worth the reader’s effort, but the author may remind the reader of a charming college professor who expects a fair amount of retention of his lectures. It is recommended for history buffs along with the reminder that the accuracy of any nonfiction book is subject to a point-in-time qualifier. Some conclusions by the author appear to be made to the advantage of his effort to make clever connections. Ruta Arellano was a docent in the California Art Gallery at the Oakland Museum. She has worked for the California Architects Board and the California Landscape Architects Board. Her book reviews have been widely published in such venues as San Francisco Book Review.